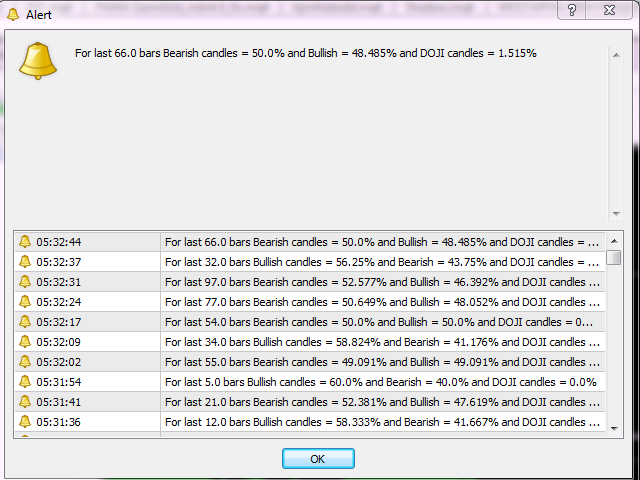 The Candles Probability indicator displays the percentage of bullish/bearish candles for the selected bar period in the form of a histogram, as well as gives an alert with detailed statistics of bars showing the percentage of bullish, bearish and DOJI candles for the period set in the input parameters. The histogram shows the percentage of bars that are prevalent in the specified period. If the histogram is green, the number of bullish candlesticks exceeds the number of bearish ones; if the histogram is red, there are more bearish bars that bullish ones. Example: if CandlesPeriod = 62 is set in the indicator settings and the indicator value on the current candle is red and equal to "57", this means that among the last 62 bars 57% of them are bearish and 43% are bullish. The indicator also takes DOJI candles into account (when the closing price is equal to the opening price) and gives detailed information in the alert. 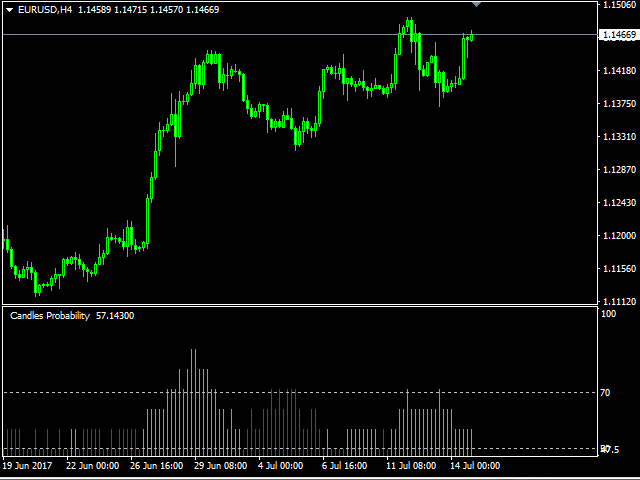 CandlesPeriod - the period of bars to calculate the indicator values. Bars - the number of bars to display the indicator values.